An entertainment system that includes a TV with surround sound and multiple speakers. A stand-alone appliance that makes large quantities of ice. A private pool with the option of being heated, when requested and paid for (if applicable) in advance of arrival; see individual home descriptions for fee and availability dates. Located outside and has jets, a heater and a hard shell. A permanent, shaded structure located near a private pool area usually with an open side facing the pool. A pool designed for use by children with no or minimal filtration, and is 18 inches or less in depth. Specific restrictions regarding the number, size or type of pets are listed in each individual home's description. A billiard game played on a small table with several fixed cushioned obstacles that necessitate the use of bank shots. Allows users of personal and hand-held computers to connect to the internet at high speed without cables. Allow large gatherings, such as weddings, for an additional fee. Guests must call our office to make arrangements for a Special Event reservation. Features and accessibility vary per home; see the individual property description, browse our homes with elevators, or call our office for details. Walkway directly from an oceanfront home with stairs to the beach. Walkway directly from an oceanfront home with no stairs to the beach. Runs directly from an oceanfront home to a neighbor’s or community walkway. May or may not have stairs to the beach. Fireplaces are generally available for use through the first week in April and after the second week in October. Please see your vacation home's amenity list for specific fireplace availability dates. The type of fireplace (wood, gas, electric) is also indicated in the home's amenity list. Private pool availability dates are listed in the Home Details section of your vacation home's web page. Private pools are generally available from the first week of May through the second week of October. Please see your home's web page for specific opening and closing dates. Pools are cleaned, vacuumed and serviced on the day of guest arrival. A mid-week service, including chemical and mechanical checks, is provided, but does not include cleaning or vacuuming. The leaseholder will be charged for additional cleanings necessary due to misuse. Some private pools have the option to be heated. Please see the vacation home description for availability dates and the heated pool fee. The heated pool option must be requested and paid for prior to arrival. Unless otherwise advertised, pools are not heated in July and August. Fees for heated pools are either fixed (plus tax) or included in the rental fee. No refunds will be issued if a guest decides they would like this amenity turned off during their stay. Requests for this optional amenity should be confirmed and paid for prior to arrival. The heated pool fee will not be prorated if this service is requested at check-in or during your stay. Please note pool heaters are delicate amenities. Their effectiveness is subject to the climate, weather conditions and ambient air temperature. Salt air is quite corrosive and may hinder the function of these amenities after prolonged exposure. Heated pools are generally able to reach a maximum temperature range of 75 to 80 degrees. Occasionally, some pools in Dare and Currituck counties experience a mild ground current. Generally this is not caused by a pool defect or the household electrical system, but appears as a result of the earth’s natural electrical current. Certain homes may be affected and the current tends to be intermittent in nature. Please be advised that this may affect the operation of pacemakers and other similar devices. Hot tubs at our vacation homes are available for use year-round. Hot tubs are cleaned, vacuumed and serviced weekly on the day of arrival. A mid-week service, including chemical and mechanical checks, is provided, but does not include cleaning or vacuuming. Occasionally, some hot tubs in Dare and Currituck counties experience a mild ground current. Generally, this is not caused by a hot tub defect or the household electrical system, but appears as a result of the earth’s natural electrical current. Certain homes may be affected and the current tends to be intermittent in nature. Please be advised that this may affect the operation of pacemakers and similar devices. Select homes offer Beach Cabana service, which includes the set-up and take-down of beach umbrella(s) and beach chairs. Umbrellas and chairs are marked with the property number for easy identification on the beach. This amenity is available from Memorial Day through Labor Day, unless otherwise noted. Beach Cabana service is available Memorial Day through Labor Day. Daily set-up and take-down of one umbrella and four beach chairs. Beach Cabana Plus service includes daily set-up and take-down of two umbrellas and six beach chairs. Availability dates vary, and can be found in the individual property amenities list. Twiddy homes that advertise Welcome Program as an amenity provide guests with a Vacation Starter Kit for their arrival. The homeowners want to take care of some of the little necessities so you may begin to relax on your vacation. 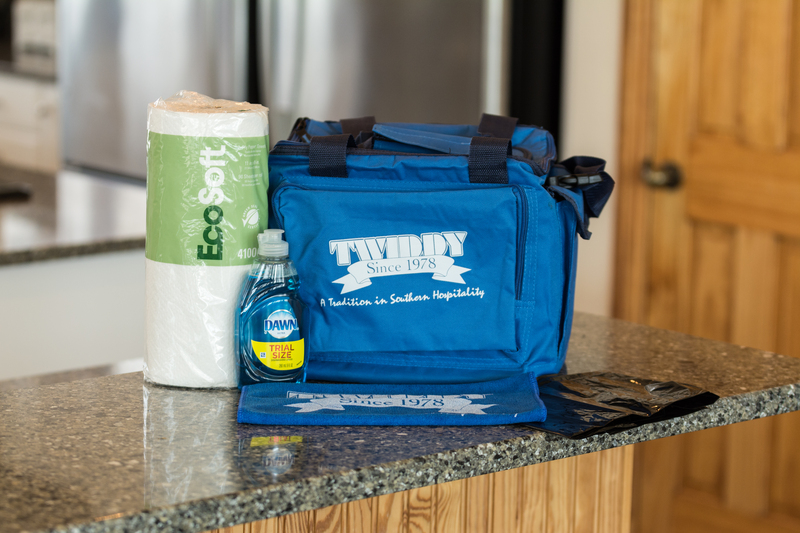 Enjoy the convenience of starter supplies, paper towels, and a trash bag all in a Twiddy insulated cooler bag. Additionally, hand soap and one roll of toilet paper will be placed in every bathroom.